'Les Roseaux' is almost the last house in the village with views down the garden to open fields and woods. The House book on your arrival, together with our Burgundy library and local maps, enlarge greatly on the local information. We have free wi-fi and satellite TV with English channels. Ground floor: Most of the ground floor is flat entry and wheelchair accessible. Kitchen including crockery, cutlery, glass etc. sufficient for a full house, microwave and dishwasher, door to courtyard. Breakfast area, with table and seating for 6. 'Grande Salle' with wood burning stove in inglenook fireplace, 2 comfortable sofas and several occasional chairs, extensive 'Burgundy' library, CD/radio/ cassette player, colour t.v. (UK satellite channels) with DVD player and video taking English cassettes (large selection for all ages), telephone. Dining table seating 14. 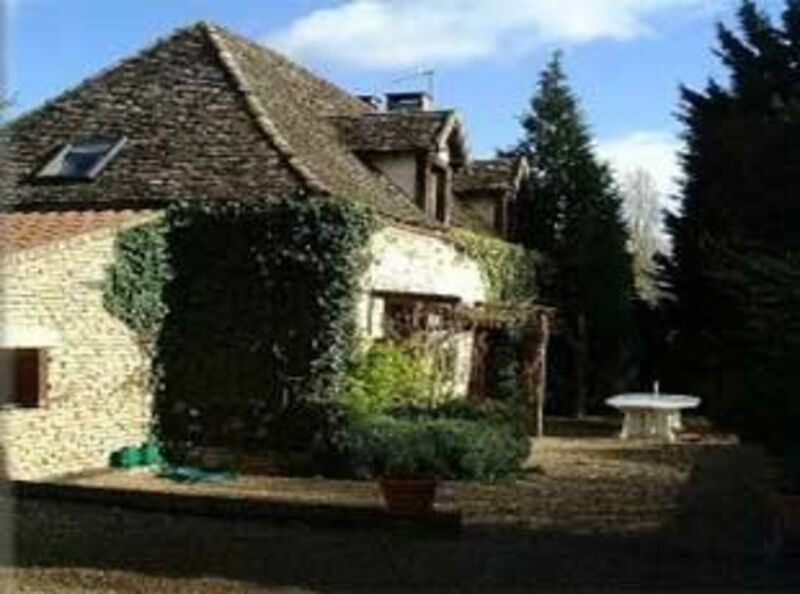 French windows to terrace and garden, door to courtyard, door to double bedroom with double bed. Bathroom with full bath, shower cabinet with integral seat and grab rails, basin. Washing machine, tumble drier, ironing board and iron. Separate W.C. The basic barn has table tennis, darts etc. leading on to secluded walled courtyard. Ample outside furniture and barbecues for full house. The 10x5m heated swimming pool is fenced and has a ladder into the deep end and steps with handrails into the shallow end. We bought the house when our children were young as an escape from the hurly burly of stressful jobs and living in London. We bought this 200 year old quirky farmhouse almost as a ruin having most recently been a nightclub - very well known locally as also a place to have wedding photographs taken in the picturesque courtyard and gardens. Neither the house nor grounds are overlooked. The house itself is quite quirky with lots of original features including two staircases into the kitchen and a further two, at either end of the house, to the upstairs bedrooms. The ground floor is flat entry with a ramp (with handrails) down from the parking area - as are the downstairs bedroom, bathroom and WC. The shower cabinet is custom made to accommodate the disabled or elderly with integral seat and grabrails. Downstairs bathroom has separate shower cubicle with grab rail and integral seat. Other aids for the elderly or disabled available, please ask at time of booking. Can be hired - although not swimming towels. Although with gorgeous baguettes not sure why anyone would toast sliced bread! Enough for even an adventurous cook! As the owner is wheelchair bound, the ground floor is genuinely wheelchair accessible with the exception of the kitchen. There is a ramp with handrails from the parking area to the terrace. Handrails to the kitchen and also into the shallow end of the pool. The downstairs shower cubicle has an intergral seat (with armrests) and grabrails. Beaune, the capital of Burgundy wines, is only 13kms (8 miles) away. A mediaeval jewel of a ramparted town and home of the world famous 'Hotel Dieu'. Apart from the major Cote d'Or vineyards we are within an easy drive of the Challonaise, Maconnais, Chablis, Beaujolais and Jura wines. An hour away the 'Morvan' has everything for the water sport enthusiast and nature lover. The drive there has spectacular views and many hidden treasures of chateaux, small domaines waiting to be discovered, and picturesque villages. There is a sports complex within a 10 min. drive. There are several golf courses within a reasonable distance, a couple of which are championship courses. Most people coming to Burgundy are interested in good food and wine. Apart from providing some of the best of both in the world there is also a wealth of culture to be had from the largest amphitheatre in 'Gaul' via superb basilicas to modern cinema festivals and the international gastronomic fair. Golf: There are several golf courses nearby. The nearest, although not that challenging, is only 15 min. away but there are a couple of championship courses within 1hr drive.